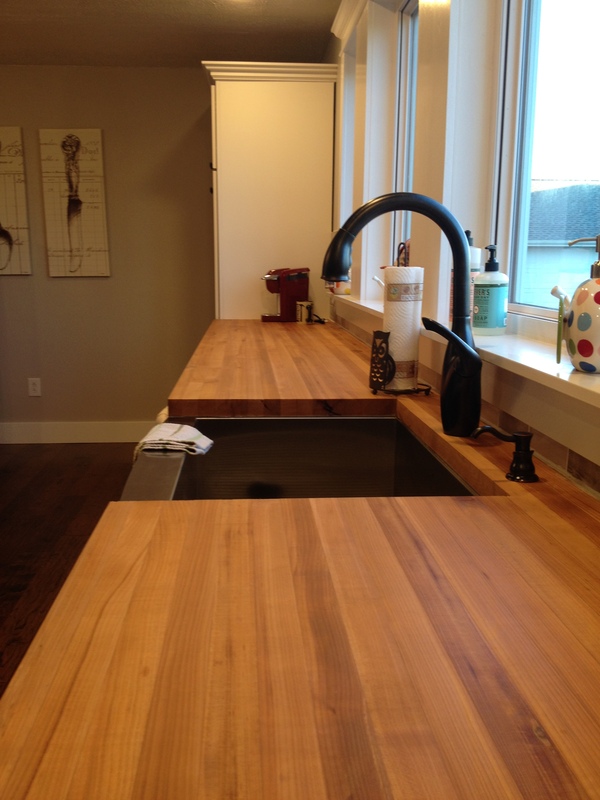 Since we remodeled our kitchen almost a year ago, I have had several people ask me about my butcher block countertops. Where did I get them? Do I like them? Did I make them? How do I take care of them? Etc. 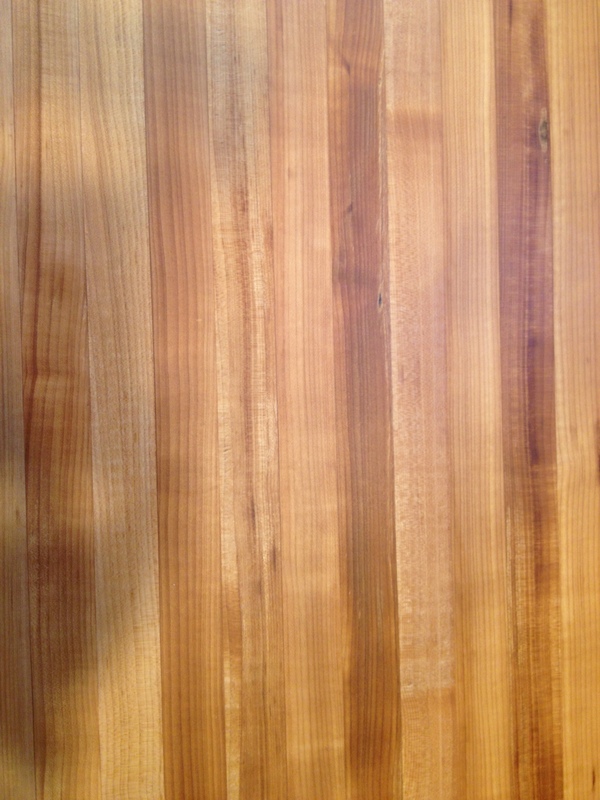 There are ALOT of differing opinions online about butcher block countertops. Trust me. I researched EVERYTHING before I got them myself. Now that I’ve had them for almost a year now, I’ll share my personal opinion from my own experience. 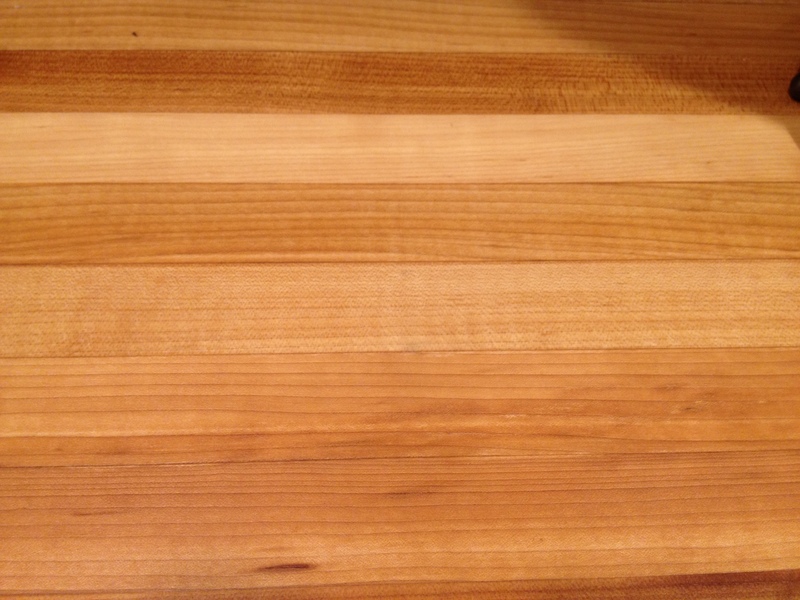 My butcher block is made of maple wood. Maple is considered a “hardwood,” but it’s kind of on the softer end of the hardwoods (from what I understand??) and it’s typically cheaper (at least around here) than most other “hard woods.” They were cut into strips and glued together. There are not any screws in them. 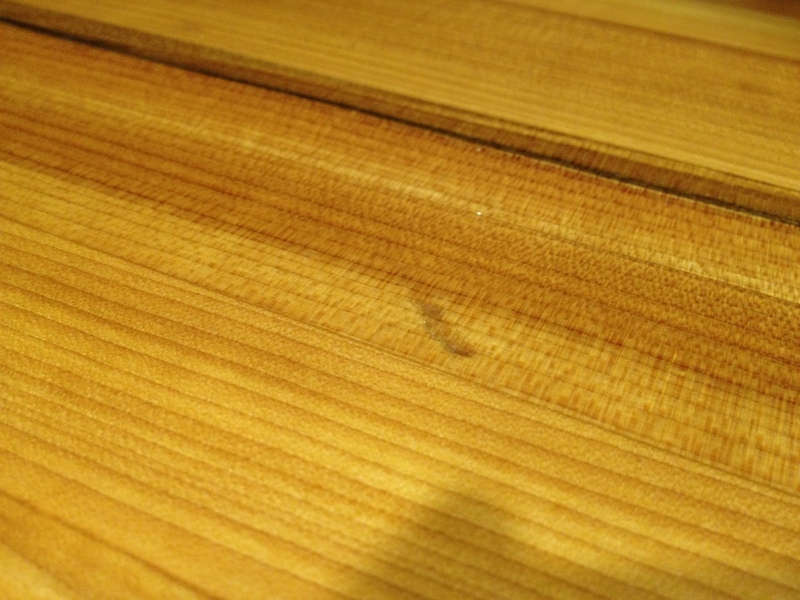 Wood glue is seriously amazing stuff…. 2. Did you make them? Oh, no. I’m not a “professional” now….and I DEFINITELY wasn’t a professional a year ago when we got these. I’ve come a long way, and at this point, I almost wish I had given it a shot, but what it would have cost me to get hardwood around here AND have it planed (because I don’t have a planer), I could have bought it cheaper already made by someone who knows good lumber suppliers and has their own massive planer. 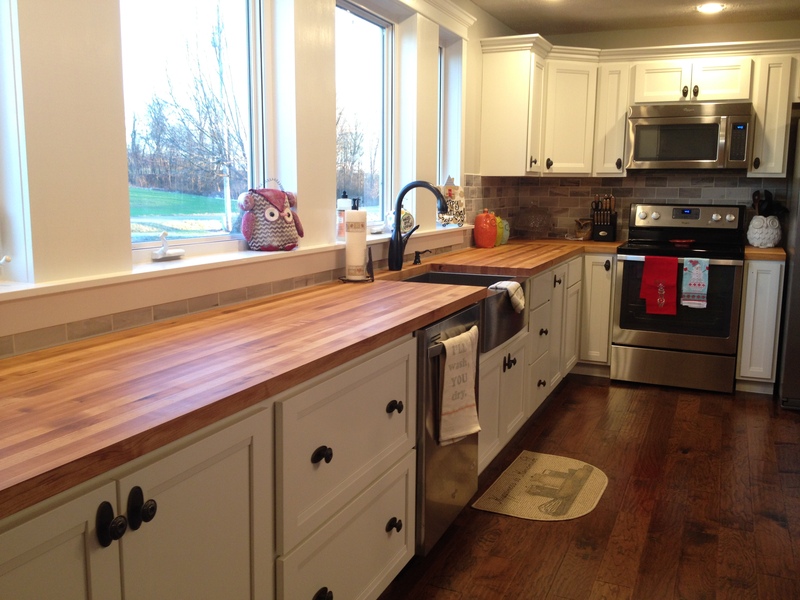 Off subject, but if we could do our kitchen remodel over again, I would have built my own cabinets, laid pine flooring and finished it myself, and made my own butcher block counters. But since we had already invested so much in the “good stuff,” we went ahead and had a professional make the counters. Plus he already had the tools. Our cabinet guy knew a guy who knew a guy….seriously. I was determined I wanted butcher block countertops, but the cabinet places were charging CRAZY prices for it. Like I mean twice the price of granite….um NO. So he gave me the name of a guy who did woodworking on the side. I called that guy and he was busy with other jobs, so he gave my information to Bond Brothers in Illinois. They made it for me and dad and I picked it up one Saturday on his big trailer (since the countertop was 16′ long). The place was like a MASSIVE super old barn FULL of random pieces of wood out in the middle of no where. Super nice guys and I was pleased with the price and the product. Highly recommended–it’s just a long way from home. 4. Did you install them? Again, no. The countertops were reasonably priced, but I really didn’t want to be the one to screw them up and have to buy them AGAIN and wait forever for them to be made again AND drive to Illinois to pick them up again. So we hired the guy that the cabinet guy knew….the one from question 3. Below is a picture when they were first installed. They darkened up a little from the oil, but they were still pretty light and dry. They have really darkened up since this picture. My one word answer: no. My more elaborated answer: the way we bought them, they were cheaper than we could have gotten laminate countertops. If I had bought them from a cabinet place, I would have paid out the….you know. And the installation was pretty reasonable, too. 6. Do they stain easy? Well, this is difficult to answer. Danny was cutting a green pepper on a plate one time and dropped a pepper seed on the countertop and let it sit there a few minutes before he wiped it off and it left a little mark. It has faded over time, but I still see it because I know where it was. You can’t hardly see it in the pic, but it’s dead center…it’s just slightly green. BUT, I accidently spilled an entire cup of HOT black coffee once when I was unplugging the Keurig, and it didn’t leave a mark. The wood grain raised some (it felt rough to the touch) and it dried out a little (probably from the heat), but I oiled it after I cleaned up the spill, and it went right back to normal. THANK GOODNESS!!!! That being said, staining is a possibility, I just haven’t figured out what stains and what doesn’t. We are careful to not get a lot of “red” sauces or juicy foods (fruits and veggies) directly on them, but I’ve been surprised at what will wipe right off without harm. 7. What do you mean by “oil” them? Mineral oil. You can find it in the laxative aisle 🙂 hahahahaha I laugh every time I buy some. 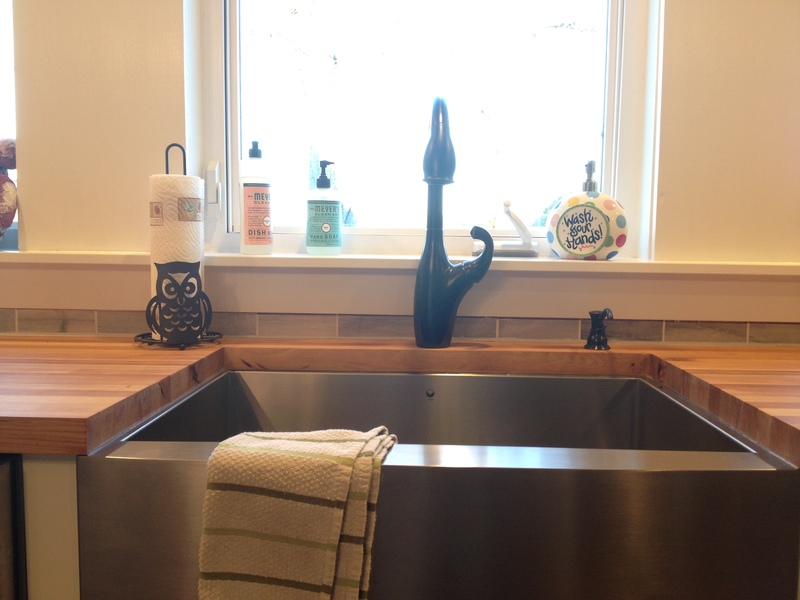 I’ve read a lot of differing opinions online about how to “seal” wood countertops and I decided on mineral oil. They make fancy expensive oils for butcher block, but mineral oil is great for it and costs like $2 a bottle. I’ve had them for a year and gone through 2.5 bottles. Not bad. The fancy stuff will cost you about $15 for a tiny bottle. No thanks. Some people suggest a SEALANT–like a poly. And even within that, there are ALOT of strong opinions–regular poly vs. marine grade boat sealants. For me, that was too much work and money. I think (my opinion and $1.25 will get you nothing more than a coke from the vending machine) people get way too technical about all this stuff. 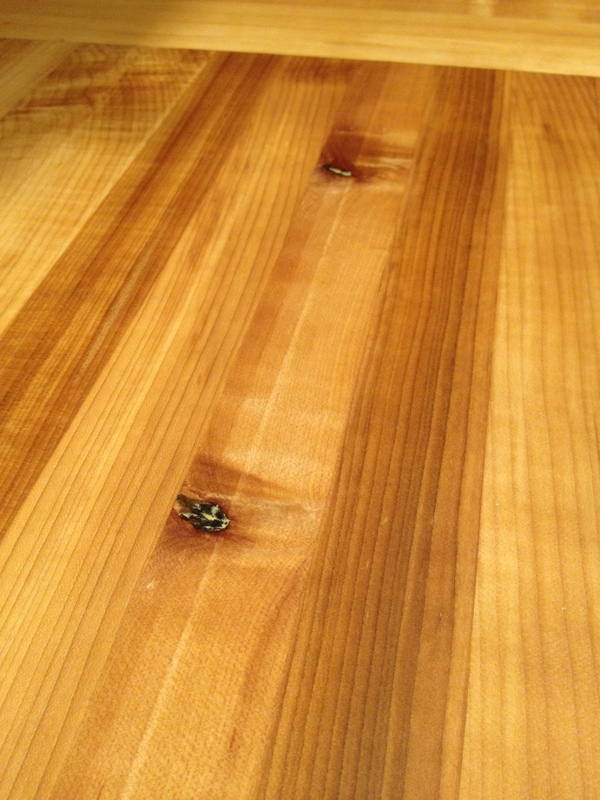 Understand what it is (wood), take care of it (oil them and wipe off water and spills), and go on about your business. I just didn’t want poly on my counters. But, I did poly the bottoms with two coats of polycrylic to prevent any warping from heat from the dishwasher, oven, etc. This was suggested by the installer. When they are new, oil them OFTEN–like every day for a couple weeks, then once a week, then maybe once a month and then just when they start to look a little dry. All you do is pour some oil on and use an old tshirt or rag and wipe it all over the countertop. Lay it on THICK. Let it set over night, then use a clean rag or tshirt to wipe off any excess oil. Sometimes it will drink it all in. If that’s the case, do it again until you end up with some excess. Heat, excessive wiping, sun–these will all dry them out faster. It takes about 15 minutes total. I save my “oily” rag in a plastic bag for use later. 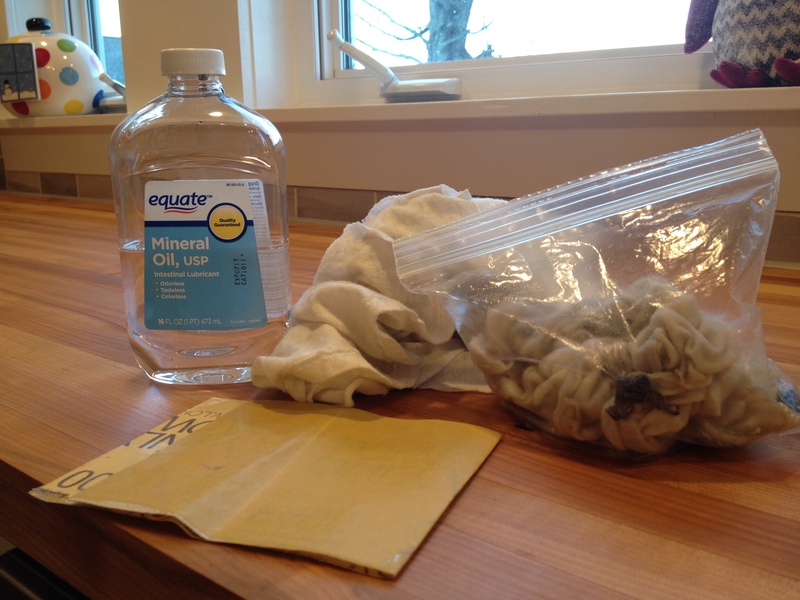 If you get a new rag every time, the rag will soak up all the oil while you are trying to wipe it on. Once it’s saturated, it will wipe the oil on much better. By the way, I do keep sand paper (400 grit) on hand if I notice any rough spots that come up if they get dry. If they are oiled properly, water shouldn’t be an issue. Caulk and/or silicone around the sink area really good and wipe any water drips you leave after washing dishes or your hands, etc. and it’s not too big of a deal. At least it hasn’t been for us over the last year. If you leave water on them, it will look lighter and be rough where it sat and dried. Just give it a quick sanding and oil the spot. They should go back to normal. You also know you need to oil when the water doesn’t bead up on them anymore. 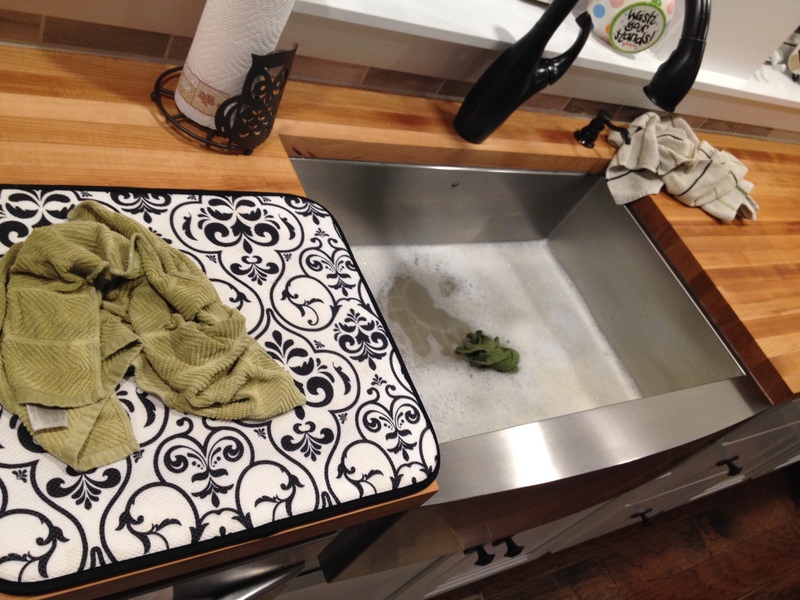 I use a drying mat when I wash dishes and wipe up any drips as soon as I notice them. Better safe than sorry. There is always the potential for water damage and rot, warping, etc. You just have to pay attention and be careful. 9. Do they scratch and/or dent easy? Yes and no. I love the look of them. 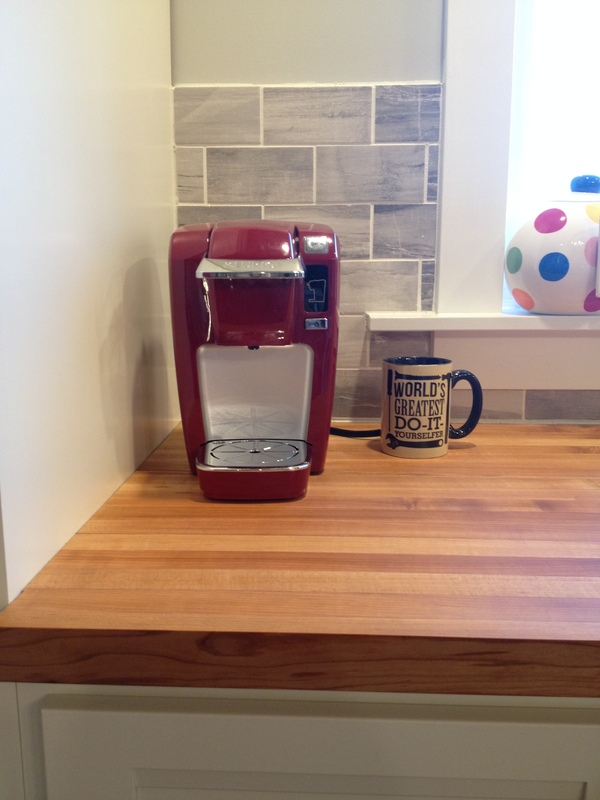 They add so much visually to our new kitchen and I’m ultimately glad we did them. But they can be a pain. We had granite at our last house and we’ve had laminate before as well. Those are kind of no maintenance countertops (although you are supposed to seal granite every year or so)–most people aren’t worried about staining, water, warping, dents, etc. with them. 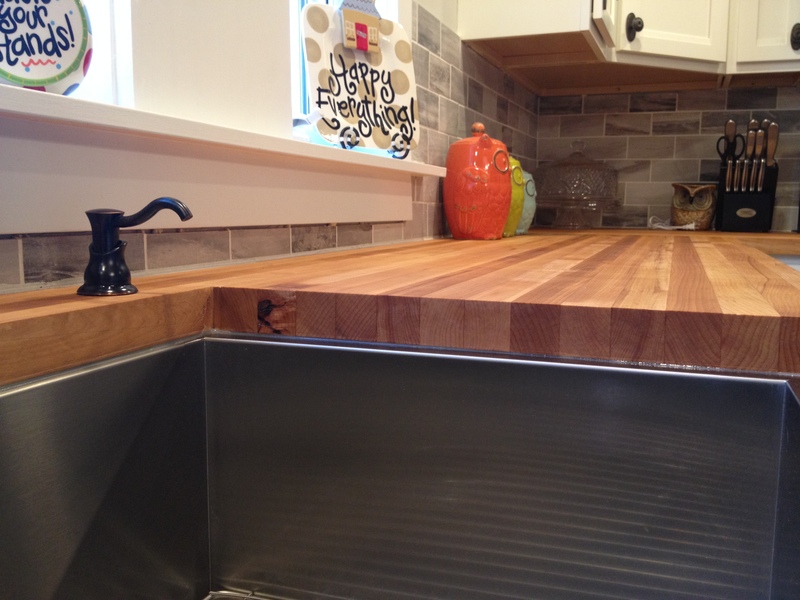 Butcher block is just a higher maintenance material, and a little more delicate. And since it is wood, it can sometimes have a mind of it’s own–expansion and contraction with temperature variation, grain raising, etc. But we haven’t noticed any problems. 1. Wood “tans.” Since the sun comes in these huge windows every morning, the counters see a lot of sunlight. I left an old scale on the countertop once and the next time I went to oil it (about a month or two later), there was an outline of where the scale was. The wood around it had darkened. I moved the scale and it eventually evened out. The more sunlight the wood gets, the darker it will get. It also darkens as it ages and as it is oiled more. 2. 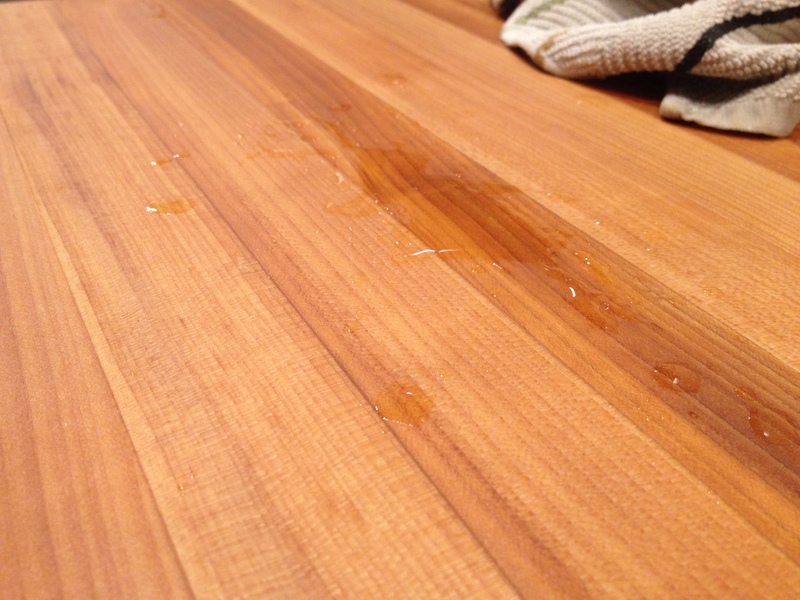 If you oil the countertops instead of sealing them with a poly, the oil WILL soak into things you place on it. If you set a piece of paper on it, it will get an oil spot. A cookbook–it will soak in the oil. Set a cardboard box of macaroni on it, and the bottom will soak in the oil. It’s inevitable. 3. You should disinfect with a water/vinegar mix. I don’t want to use harsh chemicals on it for fear of drying or discoloring the wood. I use a 50/50 water/vinegar mix to clean and disinfect. 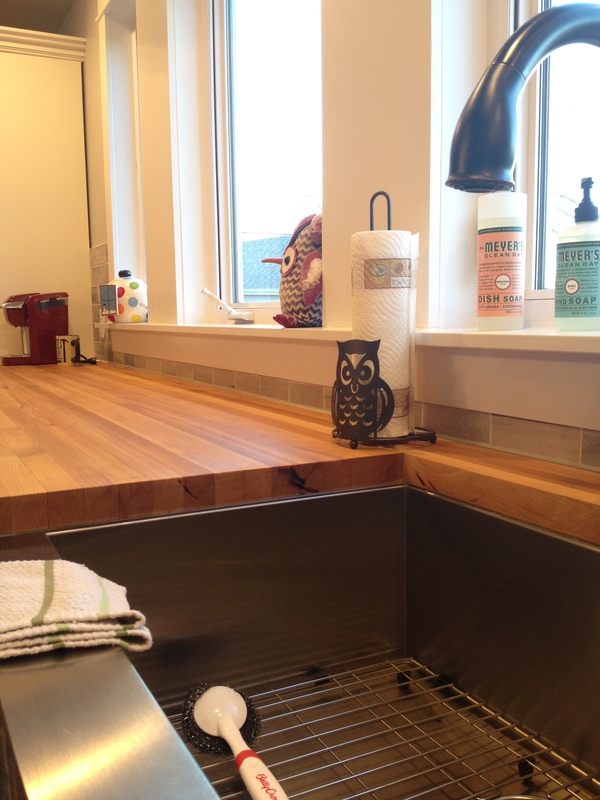 So, that is my take on butcher block countertops. A lot of info, I know. I’m sorry for such a long post, but there is a lot to say about them. What are your thoughts? Do you think it would be worth it to have them or would you rather have a less maintenance material? It’s a tough decision, I know 🙂 I hope this clears all the questions you may have about them! 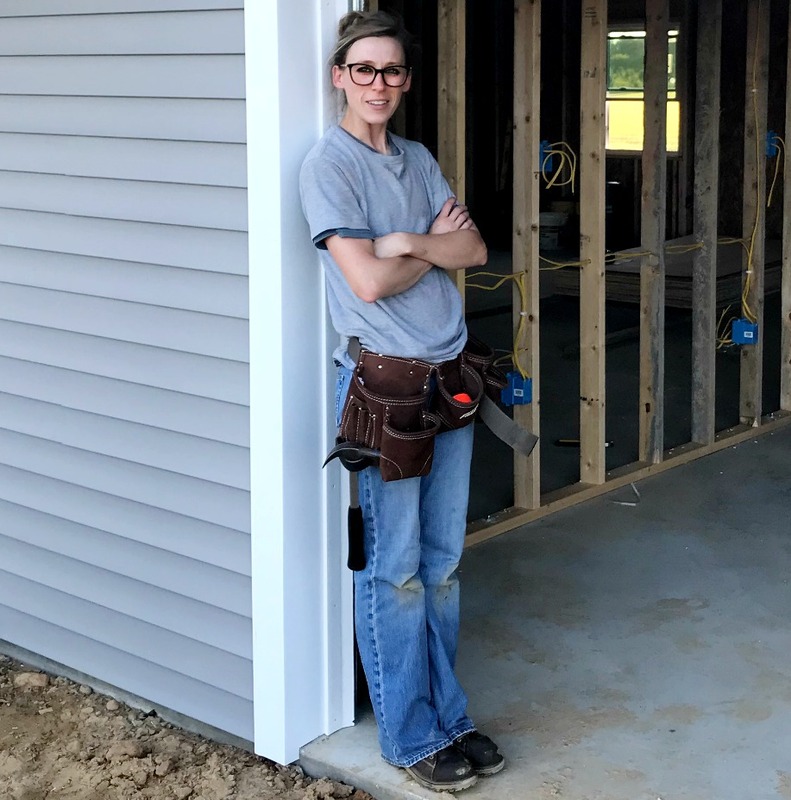 Very timely post as we are starting the process of redoing the kitchen. 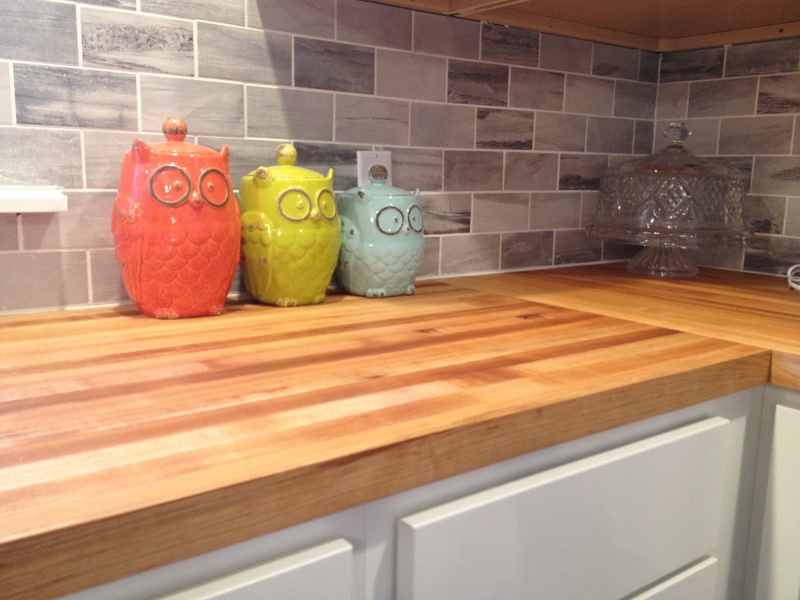 I was wondering about butcher block; it is pretty! but I think I will be happier with a lower maintenance choice after reading this. Thanks for sharing! Yay! Kitchen redos are fun 🙂 Good luck with it and I’m glad my post could help you with your countertop decision. These kinds of decisions are so difficult, I know! 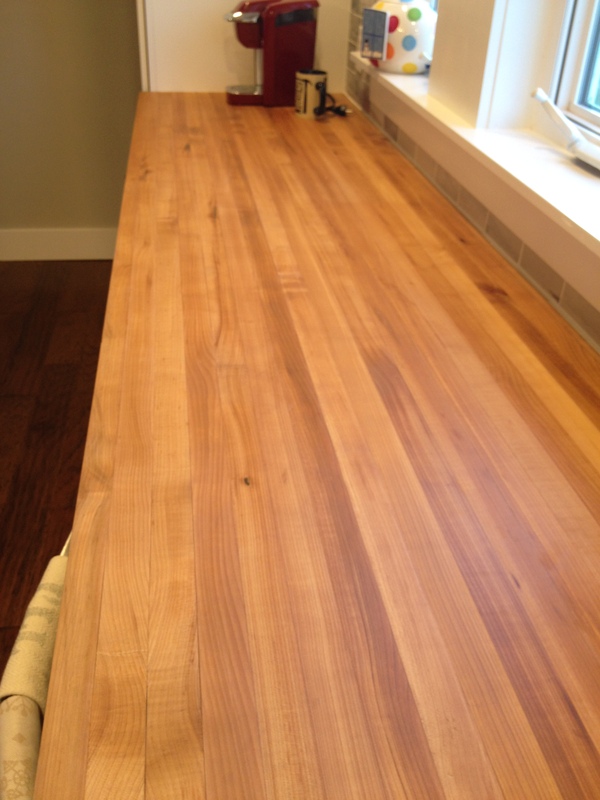 Thanks for sharing the story behind your butcher block countertops. 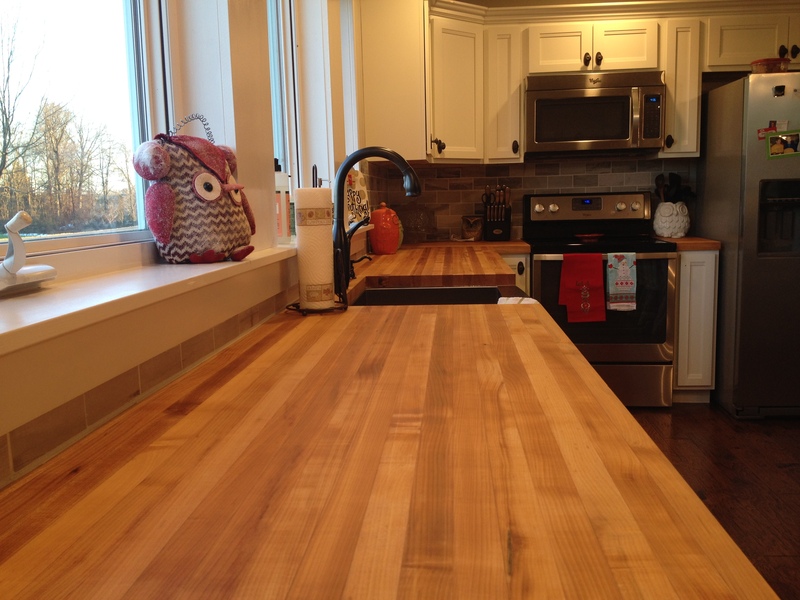 Personally when we built our home we installed granite countertops but then I made maple butcher block cutting boards for us and then two more, one for each of our daughters. I had watched a butcher block table being made by Norm Abram of The New Yankee Workshop and based on his recommendation I use maple making sure that the pieces were installed with the end grain up. It’s my understanding that that produces a harder surface and avoids most of the knife marks on a cutting board. 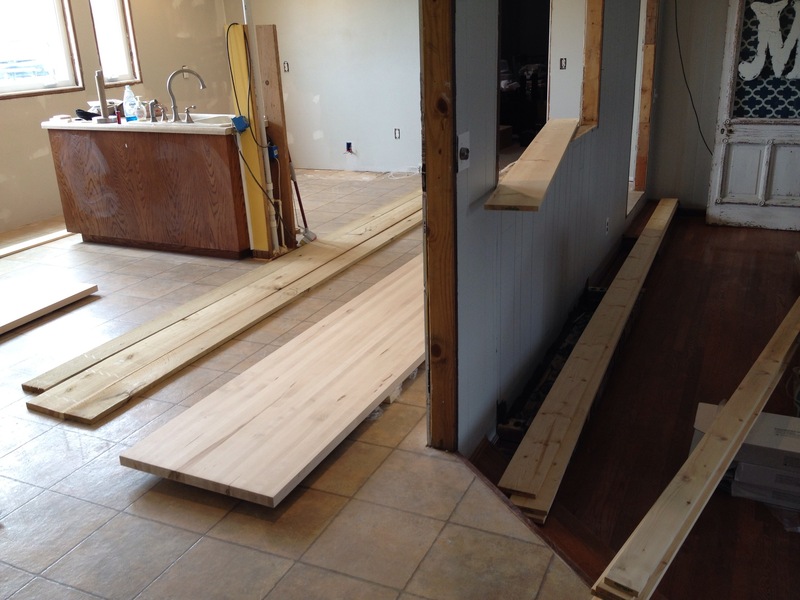 It appears that is the way your counter tops were constructed as well. I just wanted an island of butcher block with a sink. A giant cutting board. I love the way our sink and cutting board are together I just wish the board was 3 times as big. 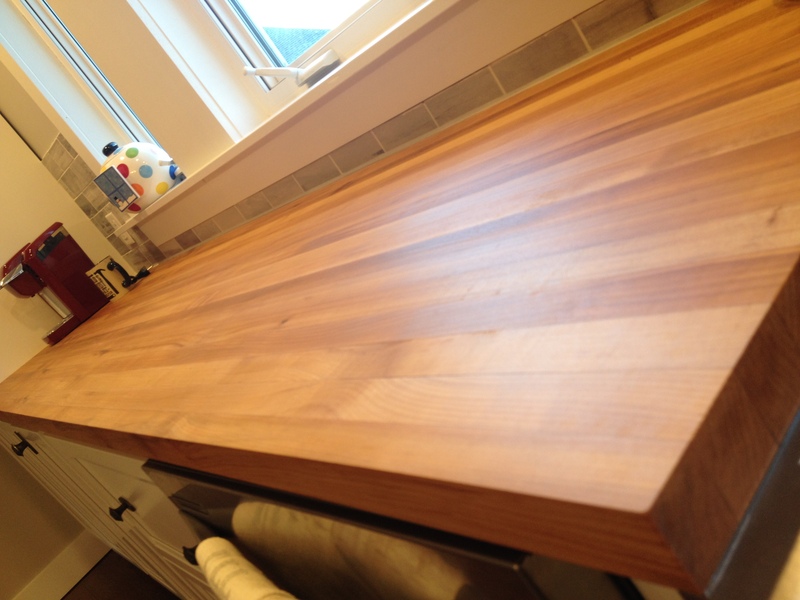 It will stain and weather just like the small board we have and I’ll be oiling it occasionally and maybe sanding it every few years to suit our eyes but it just works so well for cooking. My thoughts were to use cherry or walnut, I have a source, so they’d naturally be dark and hide some stains. I don’t think you’d want them everywhere unless we finished them with poly but then they wouldn’t match the working island. Most of the kitchens we like have a wood island top and something else everywhere else. I would have LOVED to have walnut, but it was much more expensive than maple. That’s a good point that a darker wood like walnut would hide stains better. That never occurred to me haha. So far, I’m still glad I haven’t polyed–I don’t know if it would have darkened as nicely if I had polyed it. It’s really starting to become a nice color. 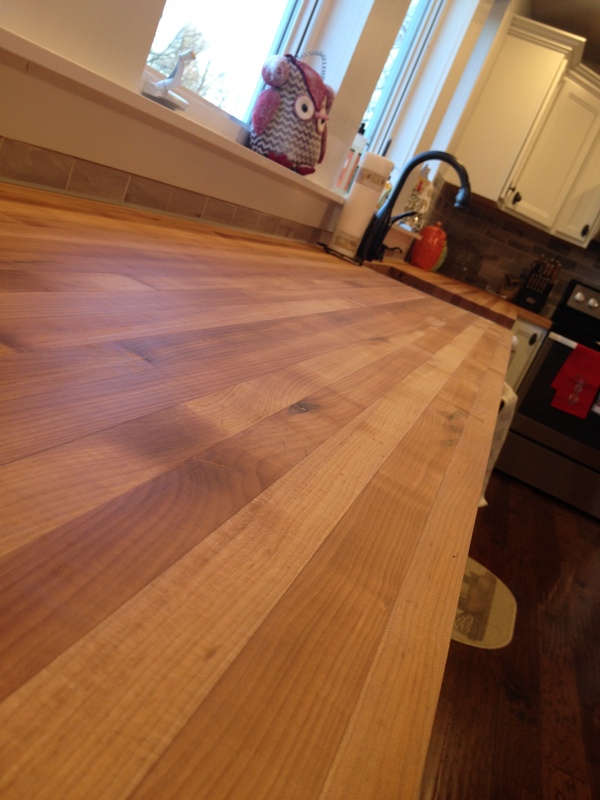 Thank you for posting a one year review of your wooden countertops….they’re lovely and warm looking! I’ve been going back and forth about what to use for months and it’s driving me a little nuts. My question is about staining around the stove, my husband loves to cook bacon and of course it splatters everywhere……have you run into problems with stains from cooking? Hello would you mind sharing your contact for purchasing the butcher blocks? We’re in Indiana but would be willing to make a drive if the price was right! Thank you in advance. Hi! I purchased my butcherblock from a place called Bond Brothers in Illinois. I highly recommend them! I’m going to come in and update because I found this very helpful. I recently used butcher block in a Florida kitchen so I’ll let you know if the Florida humidity is a factor. We have a good local supplier so mine were very reasonably priced (we were replacing hurricane damaged cabinetry so cost was a factor). I did use waterlox on mine so we can compare notes maybe if you’re still around. The waterlox is a MAJOR commitment – I worked on mine in the garage for a month before they were installed – 3 coats 2 days apart, then a curing period. But they really do look fantastic – mine are walnut and quite dark. Thank you for such an informative article. It’s been almost 3 years since you wrote the article. Are you still happy with your countertops? I’m seriously considering a mixture of stainless and wood, so would love to hear your seasoned opinion. We sold this house and moved this summer, but at the time we moved, I still loved them. 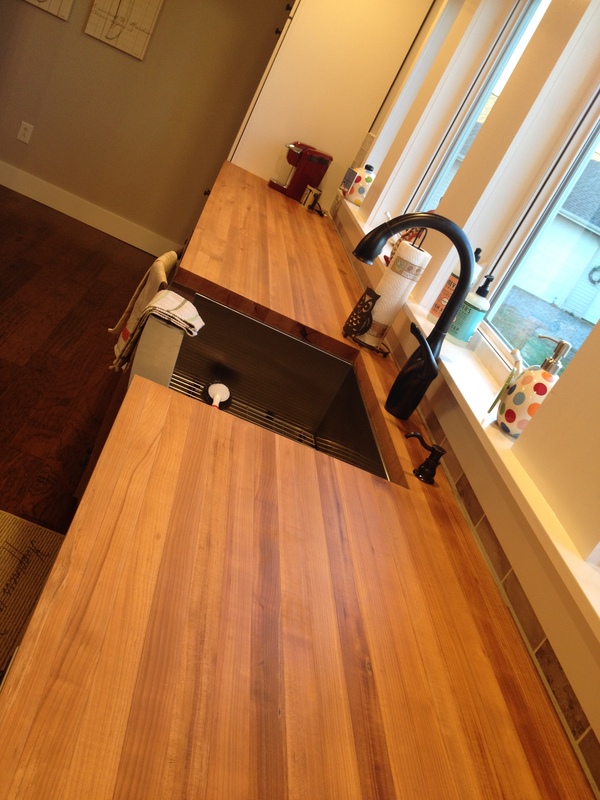 I actually built some wood countertops and installed them in our new house this fall and am happy with my choice. However, with these, I polyed them instead of oiled them. It seems to be a little less delicate to water drops and spills and a little less maintenance. But overall, I still think the butcherblock is a good option.